I used my Misti to arrange flowers and leaves and heat embossed using white embossing powder. I added a yellow matting behind my panel, which I die cut using Simon Says Stamp Stitched Rectangles. 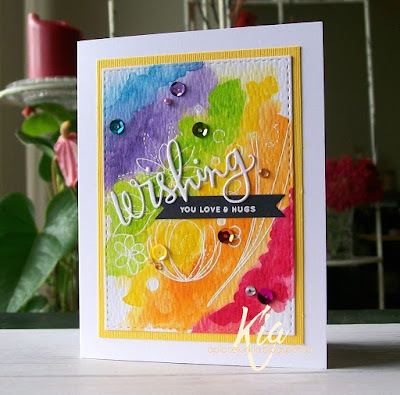 I stamped the "you love and hugs" on black cardstock with the white embossing powder, die cut using the small fishtail label from Frantic Stamper Elementals #14 Square Basics Set. I cut the Wishing sentiment and brushed on some Wink of Stella before attaching. A few scattered sequins, crystals and pearls finished my card. Thanks so much for having a look. Stamps: Simon Says Stamp Spring Flowers and Sending and Wishing, MISTI. so pretty....the rainbow colours make for a super happy card mf.